You might be feeling slightly overwhelmed if you’re taking on a home renovation project. From finding the perfect cabinetry to use in the kitchen to the countertops you’ll install in the bathroom, there’s certainly no shortage of decisions to be made. 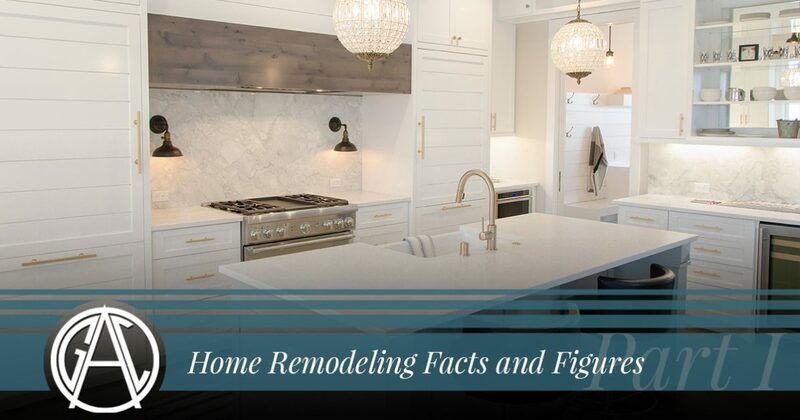 It’s important to be as informed as possible before you begin a home remodel, so in today’s post, we’ll provide you with the facts and figures you need to know in order to pull off a successful home remodel. Affordable Granite & Cabinetry Outlet is here to be your top home remodeling resource, no matter how extensive your project may be. From simple cosmetic updates to full-home renovations, we have products and designs for every style and budget. Our showroom is located at 179 South Plank Road in Newburgh, and our home remodeling experts are happy to answer any questions you have about renovation project. We also offer free estimates that can help you determine a realistic budget before you begin. We look forward to seeing you soon! The first question you’re probably asking yourself is, “How much is my home remodel going to cost?” You’re probably considering outfitting your kitchen with elegant granite countertops and spacious custom cabinetry, but you need to know if your ideas will fit within your budget. The last thing you want to find out is that your kitchen design idea prevents your bathrooms from getting a much-needed upgrade. We’re going to break down the average cost of home remodels room by room in order to give you an idea of what to expect. The average cost of remodeling a kitchen in the United States is $20,474, according to the most recent kitchen remodeling data. 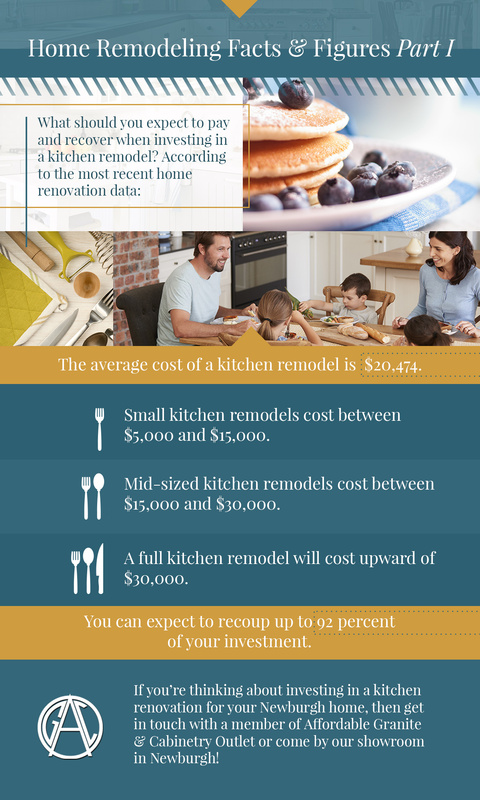 Every kitchen remodel is different, so let’s take a closer look at the cost of small, medium, and large kitchen renovation projects. A small kitchen remodel includes upgrades such as new faucets, appliances, counter extensions, and even removing walls to make room for new countertops. You can expect to pay anywhere from $5,000 to $15,000 for a small kitchen remodel, depending on the appliances and fixtures you choose to install. A medium-sized project can cost anywhere from $15,000 to $30,000, and a medium-sized remodel involves upgrades such as adding a backsplash, new kitchen cabinets, or refinishing your current cabinets. A luxury kitchen remodel involves upgrading everything in the kitchen — new appliances, granite countertops, custom kitchen cabinets, and new lighting. While you should expect to pay upward of $30,000 for a luxury kitchen remodel, the cost of your remodel will be offset significantly by the increase in your home’s value. In fact, you can expect to recover up to 92 percent of your investment when you decide to sell your home, no matter the size of your remodel. Suppose that you decided to go for a full kitchen upgrade — brand new appliances, new cabinetry, elegant new lighting fixtures, and the granite countertops you’ve always wanted. If you spent $35,000 and then sold your home in the next decade, you could expect to recover roughly $32,000! In our next post, we’ll continue to provide you with information about home remodeling as we turn our focus to bathroom remodels. If you’re thinking about investing in a kitchen renovation for your Newburgh home, then get in touch with a member of Affordable Granite & Cabinetry Outlet or come by our showroom in Newburgh! We have a fantastic selection of kitchen cabinets, kitchen countertops, and other kitchen remodeling supplies. We offer free estimates, so don’t hesitate to get started on the kitchen remodel of your dreams!